Hi, I'm Misty. I've been sewing for about 2 years now. I wish I'd started sooner since I love it! 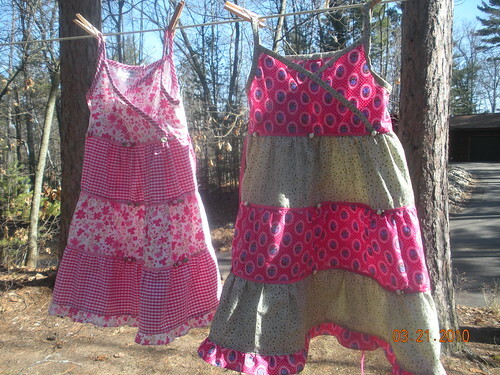 The dress on the right (dark pink and sage leaves), I made by creating a paper pattern off the one one on the left. (Which I found at a garage sale.) 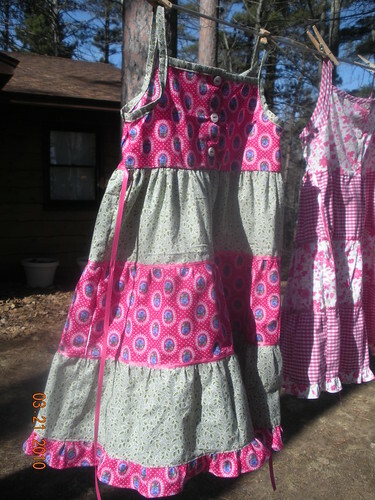 I used fabric purchased at my local thrift store. Lucky me! I think I'll do thicker straps next time. For more about me and my other "projects" please come visit my blog. Till next time, happy sewing! Wonderful choices--love the sage green with hot pink. sage green and pink, always a winning compo! cool! !